At the heart of any service business are its clients. They’re the ones who pay your bills. Without clients there can be no profit. Yet many service businesses struggle to find new clients. When we ran a poll of our readers on the WorkflowMax website, client management emerged as one of the biggest pain points. The good news is that finding clients doesn’t have to be an uphill battle. In this chapter we’ll teach you how to build an online marketing strategy, how to attract leads to your business, and how to convert those leads into paying customers. Part 1: Creating a value proposition. Part 2: Understanding market segmentation. Part 4: Creating buyer personas and finding the right leads. Part 5: Building an online marketing strategy, and the key digital marketing channels. Part 6: Using lead generation software, including Lead Manager. Part 7: Word of mouth marketing. In marketing speak, a value proposition is a service, feature or innovation which makes your company or product attractive to customers. It’s why clients are going to choose you. What benefits your product or service delivers. How it delivers benefits (in terms of quantified value). Why clients should choose you over your competitors. How do I write a value proposition? A value proposition should be written in clear language. It needs to be short, snappy, and easily understood by your prospective clients. Imagine you’re talking to a stranger. You should be able to communicate your value proposition in a way they understand; and it shouldn’t take more than 30 seconds. In writing it should only be 2-3 sentences. Avoid technical buzzwords and product jargon at all costs. Your value proposition needs to resonate with all potential clients - even those who know nothing about you. What are some examples of value propositions? Or for more inspiration, check out Lean Labs 25 value proposition examples. Refining and understanding your own value proposition is crucial before you develop your marketing strategy. Use it as a mantra at every stage of your planning process. Stick it on your fridge, teach your parrot to say it, get it tattooed (ok maybe not). But do take practical steps to keep your business value proposition in mind. Now that you have a powerful value proposition, it’s time to explore market segmentation. Imagine you’re standing at an archery range, blindfolded. You fire off a bunch of arrows and simply pray you’ll get lucky enough to hit the target. Market segmentation is designed to remove that blindfold. Market segmentation involves splitting your potential consumers into smaller groups or segments, based on various factors - age, gender, location, interests, industry, occupation. It’s the first step towards concentrating your marketing efforts on the right people. There are 3 key reasons why market segmentation plays an important role in finding new clients. It’s cost effective. By targeting the right segment through careful selection, your client conversion rates go up and your expenses go down. No more wasting money on people who are unlikely to become customers. It helps identify opportunities. By segmenting the market, you will often discover new market niches that were not immediately obvious. It gives you a competitive advantage. With market segmentation you specialise in a certain niche and are focused on a more defined target. Your marketing becomes streamlined and powerful. Target marketing is the natural partner of market segmentation. Once you have broken your potential audience into segments, you can choose where to concentrate your marketing efforts. Sometimes the process of defining your target market can feel uncomfortable. You love your business, and it’s natural to want to target as many people as possible. But more isn’t always better. A finely tuned target marketing strategy helps the right message to reach the right people. You’ll save money and get better conversion results by targeting the people most suited to your offer. The more you know about your existing clients the easier it is to reach people like them. Analyse the demographics of your current client base, and pinpoint any common characteristics. Use surveys, source reports (showing how customers found you) or feedback forms to discover why they chose you in the first place. This will help you to identify your strengths. 2. Who are your competitors targeting? Competitor research is a critical step in defining your target market. List your key competitors and try to analyse their markets. Is it possible for you to find a niche market they’re missing out on? Or if you’re targeting the exact same market, what benefits can you offer over them? 3. Who needs your product or service most? This will tie directly in with your value proposition. How does your product or service fulfill a potential client’s needs? What benefits do you offer over your competitors? How will you make their life easier, or better, in a tangible way? Which market segments desire these benefits the most? 4. What are the relevant demographics? Demographic factors like location, age, gender, profession, relationship status and more will tie in directly with the type of product or service you’re offering. Be as detailed as possible when sketching your buyer demographic - this information will help you craft buyer personas shortly. 5. What are the relevant psychographics? While demographics help to create a picture of ‘who’ your client is, psychographics tell us ‘why’ they become clients. Psychographics cover the personality, values, lifestyle, opinions, and interests of your target market. They are the emotional and behavioural triggers that push people to seek out your service. It’s not only about targeting the market who are most likely to buy your products. It’s also about budget, scale and practicality. Ask yourself which consumers you can realistically compete for - taking geography, resources, capacity and budget into consideration. A buyer persona is a fictionalised character created to represent your target audience. It combines both demographic and psychographic data. Creating buyer personas can be highly beneficial for your digital marketing strategy. It helps you keep a clear picture of your audience in mind and create advertising that will resonate with their personalities. Once you conceptualise these characters, you’ll find it much easier to create marketing that appeals to their behavioural and emotional triggers. There are plenty of free online tools for creating buyer personas. Here's one I whipped up in Xtensio's user persona creator. As you can see, this profile tells us about a fictional person called Marketing Mandy. 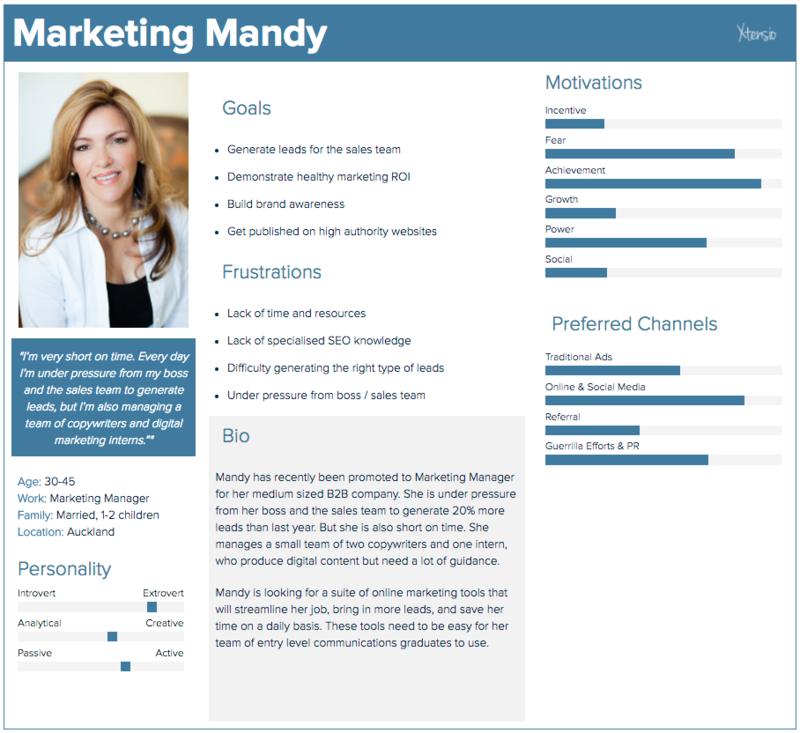 At a glance we can see Mandy's demographics, personality, career goals and motivations. Even though Mandy isn't real, this profile will help advertisers to reach people like her. You can target the messaging, focus and content of your ads to appeal to Mandy. Excellent! You have a value proposition, a defined target audience and have crafted some buyer personas. You know exactly what you’re selling and to who. The next step towards finding clients is creating a kickass online marketing strategy… But where do you start? First you need to understand your customer journey. I bet you’ve heard people refer to the ‘marketing funnel’ over and over again. But a quick Google search will churn out thousands of variations. Some are solely focused on inbound marketing, some throw around buzzwords like TOFU and MOFU. Which one is right for your business? Underneath all the hype, most marketing funnels have four core stages. These stages correlate with the customer journey. This is the basic marketing funnel to use when you’re starting out. Awareness, Interest, Decision, Action. These are the 4 stages your customer goes through to make a purchase, or become a client. Each of your digital marketing campaigns should be targeted at people in different stages of the funnel. This is known as 'lead nurturing'. Once you understand the basic customer journey funnel you can use it as a blueprint for your online marketing. There are a huge range of digital marketing channels you can use to collect leads and nurture clients. In this section we’ll look at the 6 major channels: SEO, paid search, display ads, content marketing, email and social media. These days the first place we turn to find something - whether it’s pizza or a divorce lawyer - is Google. Your business *must* rank highly on search engines or you’ll lose thousands of potential clients. Every page of your website should be SEO optimised. This means including relevant search keywords in your copy, headings, image file names and metadata. Long tail keywords are easier to rank for. The more specific a phrase is (imagine what a client would type when searching for you) the less competition you’ll have. Fresh content is king. A blog or frequently updated website section will help you to rank more highly. Your site speed and mobile responsiveness can influence SEO. Use Google’s PageSpeed Insights to identify your areas for improvement. Links to and from other sites are important. If high authority sites link to your content it can boost your rankings significantly. These are just a few factors involved in SEO. If you’re a beginner check out 10 Quick n' Easy SEO Tips. For an excellent in-depth resource check out Single Grain's Effective SEO Techniques that Work in 2017. They are called PPC ads because you only pay when someone clicks on your ad. You can tailor them to appear when specific search terms are used (e.g. competitor names or keywords relevant to your product). PPC ads are popular because they are flexible, effective for almost any industry, and highly customisable. For an easy to digest overview see the Noob Guide to Understanding PPC at Unbounce. Display advertising is old school…the first banner ad appeared over two decades ago! Display ads carry a bad reputation due to their interruptive nature. The rising popularity of AdBlock indicates that people are sick of pop-ups. But display advertising hasn’t died; it’s fighting back harder than ever. The invention of retargeting pixels means ads can follow users around different websites, giving them more relevant content. Video ads and mobile ads are also changing the game. Don’t be intrusive. Full screen pop-ups were recently voted one of the most hated ads. Try to protect the user experience when designing ads. Offer value. Slightly intrusive ads can be forgiven if they offer great value. Discount codes are particularly effective, combined with retargeting. Display relevant content. Be careful that you’re targeting the right audience, and that your ads are appearing in a relevant context. Use placement exclusion filters. These let you prevent your ad from being shown on any websites you don’t want associated with your brand. Content marketing refers to the distribution of informative, entertaining and consistent content; primarily online. When done well, content marketing can attract audience interest and increase brand awareness, sometimes even driving actions like email sign-ups or conversions. Stick to a regular blogging schedule. Fresh content is noticed by Google, helping you to boost your SEO rankings and get more traffic. Write content purely for your target audience. The most important aspect of content marketing is providing real value to your target market. What do they want to read? Write guest posts, and network with other prominent bloggers. Links from other high authority websites to your posts can boost your own SEO ranking significantly. Send out a regular blog newsletter. This is a great way of capturing leads, building a relationship with your audience, and of course getting more views. Other popular forms of content marketing include whitepapers, infographics, podcasts, videos and ebooks. See Buffer’s 6 Types of Content to Boost Traffic & Drive Engagement for some useful tips. Email marketing remains one of the most powerful digital channels at your disposal. It’s one of the fastest and most direct ways to reach people with information. But it’s easy to go wrong with email marketing. Unwanted correspondence can feel intrusive, and spam filters send your messages astray. The trick is obtaining permission from your audience first and treating that delicate relationship with respect. Keep your promises. If someone gives you their contact details because you promised to send them 1x newsletter a week, stick to this. Don’t send more or less. Sign off with a name. People prefer receiving emails from an actual person or account manager, not simply a brand. Use mobile responsive templates. Many people check their emails from mobile, make sure your emails look good on any device. Include clear CTAs on your website. Make it as easy as possible for people to opt into your newsletter, or use gated downloadable content to obtain their emails. Conduct A/B testing. Different subjects, copy, CTA’s and headline combinations will resonate with different audiences. Regular testing and optimisation is the best way to perfect your campaign. Social media is one of the most powerful digital marketing tools, especially for small business. It’s affordable, scalable and customisable. You can use social media at all stages of your marketing funnel - attracting new audiences, nurturing them to convert, and then helping clients to advocate on your behalf. Choose the right platform for your industry. Check out our beginner's guide to social media comparing the main platforms - Instagram, LinkedIn, Twitter, Pinterest, Google+, Facebook - to see which suits your industry and target audience best. Advertising over community growth. If you don’t have the time and resources to pour into a fan page, you can still run an advertising campaign linking directly to a landing page. Retargeting is a powerful tool. Don’t be fooled into purchasing a third party program to manage your retargeting - you can do it directly on Facebook and get the same results. Use custom audiences to their full potential. If you have the budget, a social media consultant or specialist can help you get up and running. Lead generation is the process of identifying and building a database of potential clients, based on people who’ve expressed an interest in your business. 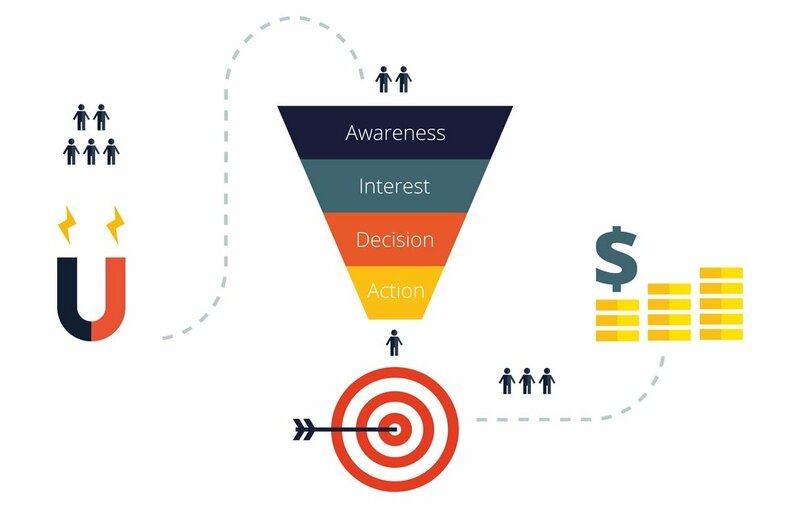 Once you’ve captured leads you need to identify where they’re sitting in your marketing funnel. Are they ready to buy? Or are they just tentatively exploring options? Once you know what stage they’re at in their decision making process, your goal is to nurture them with the right messaging until they become a client. While the digital marketing channels discussed are powerful tools on their own, sometimes you need lead generation software to really maximise their impact. Why use lead generation software? Lead generation software helps you to collect, organise and manage your business leads in one place. By tracking your marketing channels, it gives you full visibility of every lead throughout their journey. You can see how the person first discovered your business, and any actions subsequently taken. Lead generation software also allows you to analyse and compare historical data. These insights are essential for making good decisions going forward. You can conduct tests, tweak and optimise campaigns to maximise your impact. If a person drops out of your sales funnel lead generation software can help you to figure out why. By analysing their actions - which products, pages, and services they viewed, and at what moment they abandoned the buyer’s journey, you can try to re-engage them. Or if you’re regularly losing leads in the same place you’ll know there’s a problem. Perhaps one of your landing pages just isn’t up to scratch, or your marketing emails are too frequent. Lead generation software can help you pinpoint the weakest points of your strategy and patch any holes before you lose too many potential clients. With WorkflowMax Lead Manager you can track your leads, proposals and sales pipeline from one place. Easily view the percentage of leads for each month and see how your sales team is performing. Compare leads by month, leads by staff, or leads by category. There’s also lead generation software with integrated marketing. Our favourites are those which combine powerful marketing automation tools with CRM, allowing you to manage everything in one place. Hubspot: Reasonably priced all-in-one marketing software, with integrated lead nurturing and marketing analytics tools. Good for small to medium sized businesses. InfusionSoft: All-in-one system including email marketing automation, CRM, lead management, and even e-commerce management. Designed for small businesses. Marketo: Offers powerful tools for customer nurturing, customised and scalable segmentation, and engagement channels. A more expensive, high end option for B2B or B2C companies. ActiveCampaign: Another software offering email marketing, automation, sales lead management and CRM. Primarily for small businesses. Word of mouth referrals are like gold in the marketing world. But you can’t just sit back and wait for the phone to start ringing. Here are some tips to increase your chance of getting word of mouth business. Too many business owners assume that if they provide great service, word of mouth referrals will magically happen. In some cases this is true, but you can drastically improve your chances by being proactive. Make it as easy as possible for customers to leave you feedback or reviews. Help them to spread the word. One way to do this is setting up your business on review sites relevant to your industry. Here’s a list of prominent review sites for B2C and B2B companies. Creating a Facebook page for your business will also give customers to opportunity to leave reviews. Simply creating these channels isn’t enough - you want to actively encourage reviews. Ask customers directly as part of your sales process, and provide links to the appropriate sites. Referral bonuses are a powerful way of driving word of mouth reviews. By offering your clients with cash or product incentives they are more likely to recommend you to friends, family and colleagues. These bonuses can take the form of free products, service discounts or extra features. Showing gratitude is a natural part of closing the sales process. You probably have an automated email thanking clients for their business, and a note of thanks in your invoice as well. But showing delightful gratitude takes this to the next level with a more personal gesture. Try sending important clients a handwritten note or small gift so they feel truly appreciated. One of the best ways to provide top-notch service is by remembering client information. WorkflowMax project management software offers several tools for helping you to do this. Say you're a construction manager and your client requests a last minute meeting. You rush to meet him on site. Instead of arriving flustered and confused, you log into the WorkflowMax mobile app while you're in the taxi. This shows you the job information at a glance - including completed tasks, milestones, and related documents. You're fully prepared for whatever your client asks you. You can even call or message them from within the app. WorkflowMax also helps you remember personal details about your clients. Client Manager keeps all their contact information in one place. You might want to remember that your client likes their coffee black, is scared of your dog, enjoys sauvignon blanc, or that their birthday is November 20th. With Custom Fields in WorkflowMax you'll be able to personalise your service and delight every client - even if you have hundreds of them! In short... Delight and surprise your clients. Exceed their expectations. And consistently provide them with a 5 star service. There you have it - a pretty comprehensive run-down of strategies to find new clients. Of course, after finding new clients it’s crucial that you master the onboarding process. In the next chapter of 'The Ultimate Guide to Client Management' we’ll look at client onboarding strategies, customer service agreements, quoting and how to hold an amazing kickoff meeting. Coming soon!